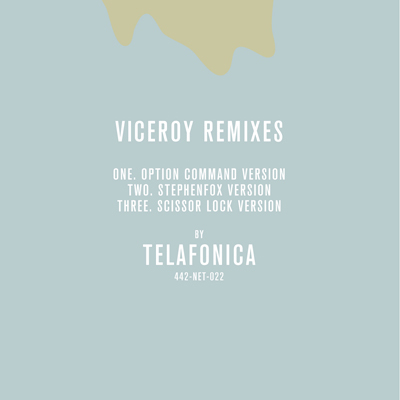 Viceroy Remixes EP is available for free (or pay what you like) download via Bandcamp. The first of the monthly installments of remix EPs for the 'Sleeping With The Fishermen' album. Option Command goes all wonky and compressed for his woozy remake. StephenFox grabs the melancholy and sets it wrestling against flecks of noise and hiss. Scissor Lock ditches the song altogether and strings out its inherent buzz into a longform spectral drone. The master stems have also been released to the public for anyone to create their own fan mix. All fan mixes will be published online via Bandcamp. Head to tiny.cc/telafonica-viceroy for the files. Send your remixes as aiff or wav files to contact@4-4-2music.com via wetranser.com, yousendit.com or any such large file transfer system. We shall master them for you before publishing the remixes.